The root of our love for plants is an innate force of nature known as biophilia. Explore this fundamental attraction through an all-new exhibition in the Enid A. Haupt Conservatory, curated viewings of the vast collections of the William and Lynda Steere Herbarium and LuEsther T. Mertz Library, informative tours, a propagation demo, and a #plantlove Happy Hour co-hosted by The Sill, ihavethisthingwithurbanjungles, and ApartmentBotanist—each designed to help foster a deeper connection with the natural world. Explore Biophilia: Sharing Our #plantlove to see the Conservatory’s permanent collections anew through the lens of the curators and gardeners who care for them. 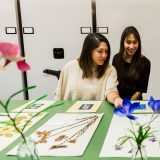 Delve into the remarkable scientific history of our love affair with plants during a behind-the-scenes look into the William and Lynda Steere Herbarium. The Herbarium is the second largest collection of dried plant specimens from around the world and throughout time. 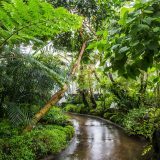 Here you will learn about the evolutionary origins of your favorite houseplants and see collections of their wild relatives. Immerse yourself in stories of professional and amateur plant hunters, whose dedication and love for plants have influenced culture, art, and conservation. Craft your own paper plantain lily to take home as a memento. What does a floral bouquet really say? Uncover the “language of flowers” and literary floral lore throughout the ages. 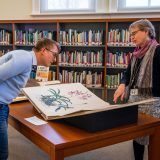 Our staff has selected rare book and exquisite plant illustrations that express every emotion, from Victorian plant mania to contemporary romance. See unusual treasures such as pressed plant albums, hand-colored folios, and gold-stamped bindings, and take home a #ColorOurCollections coloring book as a souvenir of the Mertz Library. Saturday & Sunday; 2 p.m.
Angélica Negrón debuts as the year-long composer in residency at NYBG. Panorama: Amanda Gookin and Eleonore Oppenheim perform works by Angélica Negrón and other contemporary composers who were inspired by their love of plants and nature. 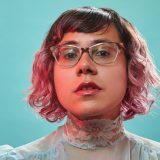 Paisaje: Angélica Negrón performs her original sonic landscapes scored for voice, percussion, and plants. Meet up with fellow plant lovers for botanically inspired drinks and crafts. Join experts for propagation and composting workshops, and tours of the rain forest gallery. Plus, stop by the propagation bar at NYBG Shop to purchase a piece of #plantlove to take home. 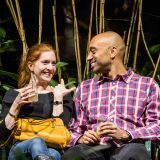 Saturday; 10 a.m.–12 p.m. & 1–3 p.m.
Tour the Haupt Conservatory’s Rain Forest Galleries to find the most “Instagrammable” plants and spots—from a wall of climbing Monstera deliciosa to the Vanilla orchid and Theobroma cacao. Want to grow your own plant babies? 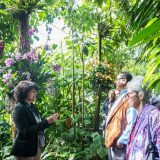 Join experts Marc Hachadourian, Director of Glasshouse Horticulture and Senior Curator of Orchids at NYBG, and The Sill, to learn the basics of how to cultivate plants from cuttings. See how sometimes it takes as little as a single leaf from a plant you’ve been admiring to establish a thriving new specimen of your own. All weekend long, stop by NYBG Shop for the debut of the new propagation bar, featuring favorites such as neon pothos, rex begonias, and more. Purchase rooted cuttings taken from mature plants to pot and grow to their full potential at home.